My girlfriend, Sarah Hart, is joining me for some of this season in Chalten, and arrived on the same day that Jon took off. We had a week of bouldering in relatively stormy weather, and then yet another weather window descended upon Chalten – this time an extended one. Although Sarah’s only two previous ascents in the Chalten massif were Aguja Innominata and Cerro Solo, we decided that we had to try to profit from such a long weather window, and headed to the biggest objective we had planned to try together: the Goretta Pillar of Fitz Roy. 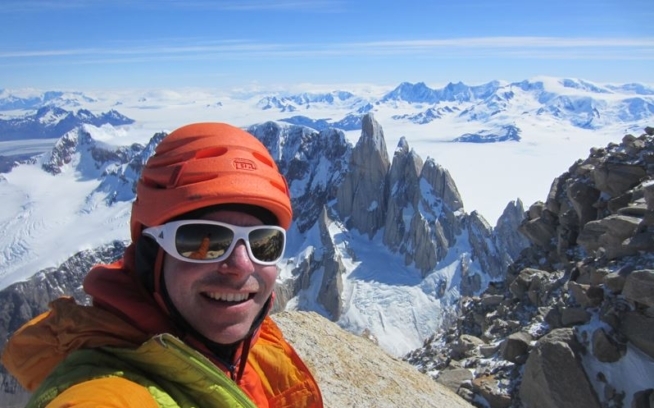 We decided to try the route, “Mate, Porro, y Todo lo Demas,” which was climbed to the top of the Goretta Pillar in 2008 by Rolando Garibotti and Bean Bowers, and finished to the summit in 2011 by Matjaz Dusic and Lovro Vrsnik. Since then it has had a handful of subsequent ascents. Sarah, gracious and generous as always, agreed to a plan to let me do all the leading. Although our rock climbing abilities are very similar, we figured that all my experience climbing in the range would make us climb a bit faster with this strategy. 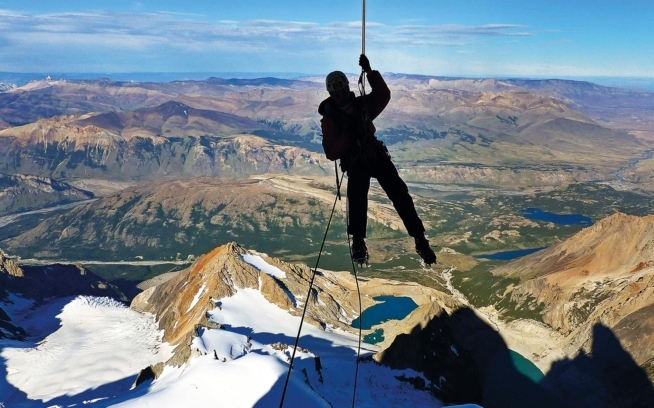 Additionally, since I have already climbed Fitz Roy via the Goretta Pillar two times before, trying to lead everything myself would make it still an exciting challenge for myself. However, to make the experience still enjoyable and exciting for Sarah, we opted not to take jumars, which undoubtably is a less efficient strategy, and more challenge yet! We hiked into the Rio Electrico valley on Friday, January 11th, but because of wind and rain decided not to continue up to the Piedras Negras camp, and instead camped down in the forest above Piedra del Fraile. On Saturday we left our camp early, and made our approach over Paso del Cuadrado and up the Glaciar Fitz Roy Norte. As we climbed up the snow slopes below the west side of the Goretta Pillar we realized that conditions were much worse than we had hoped – a lot of the rock was snowed up, especially on the lower portion of the pillar. Nonetheless, the weather window was forecasted to last long enough to afford a slow pace, and we started up the initial pitches wearing crampons and mixed climbing in our very basic ice gear. The first part of the route is 4th-class rock where one would normally simul-climb, but in the snowy conditions we decided to pitch it out. When the fifth class pitches began, I was forced to climb the first several mostly on direct aid, using an ice tool to chip the ice out for almost every placement. We lost a lot of time on these initial pitches, but as the sun came onto the rock the ice began to melt very quickly, and as we gained height the rock became drier and drier. At the end of our first day we had only climbed about half-way up the Pillar, and were forced to bivouac on a small uncomfortable ledge, rather than the large terrace two-thirds of the way up the Pillar. We got a leisurely start on our second day, and climbed up to the large terrace on pleasantly almost-dry rock. After a lunch break on the large terrace, we tackled the upper pitches of the Pillar, which now were unfortunately running with large amounts of water. We arrived to our second bivouac, the top of the Goretta Pillar, the same way we had arrived to our first bivouac – by headlamp. The one time I have previously slept on top of the Goretta Pillar it was quite comfortable, but this time it was very snowy and we spent at least an hour and half chopping ice before we settled onto our bivouac ledge. Already quite tired, we got a leisurely start again on our third day, rappelled into the notch between the Goretta Pillar and the upper mountain, and tackled our last block of hard climbing. We once again had to deal with a lot of ice in the cracks and running water, but at least at this point we were quite accustomed to it! We reached the summit of Fitz Roy in the early evening, and were joined there by two young climbers from Provincia San Juan, Carlitos and Iñaki, who had just climbed El Corazon, on the east face. Sarah and I decided to start descending immediately, as the wind was already beginning to pick up. However, after a couple of rappels, Carlitos and Iñaki yelled to us to wait, and asked if they might rappel with us. As it turned out, they had core-shot one of their ropes on the ascent, and with only one usable rope were going to be in for a tricky descent. Additionally, since they had originally planned to descend El Corazon, they had only one pair of crampons, and to top things off, Carlitos had taken a big fall on the ascent that had left him with a broken heel! Rappelling as a group of four is of course much slower than a group of two, so we ended up spending another night on the mountain, at La Brecha de los Italianos, but it was all OK because Iñaki treated us to mashed potatoes and soup – a welcome trade since Sarah and I were now out of food! We finished the rappels and hiked out the next day, completing a very satisfying adventure! We were joined on “Mate, Porro, y Todo lo Demas,” by two other teams, Kate Rutherford and Madeleine Sorkin (from the US), and Luciano Fiorenza, Jorge ____, and Sergio Tartari (from Bariloche, Argentina and Salinas, Brasil). Everyone was happy to share the route, and congrats especially to Kate and Madeleine for making an all-female ascent of Fitz Roy (I believe the first via the Goretta Pillar, and perhaps the fourth ever of Fitz Roy). Colin was born in Seattle in 1984 and still calls it home today. He grew up hiking, skiing and climbing in the rugged Cascade Mountains where he developed a love of mountain adventure and an indifference to foul weather. 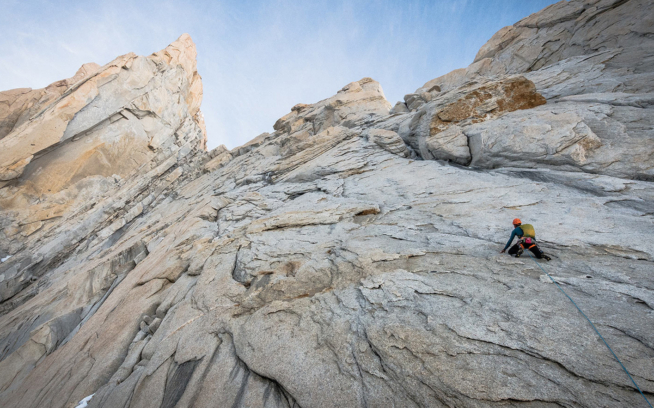 His climbing is focused on the mountains of Alaska and Patagonia, where he’s drawn to the steepest alpine faces.